Just beyond the medieval ring wall of the Tuscan town of Lucca, the city rapidly gives way to country villas and agrarian pastures. Among these fertile hills, a flourishing cooperative community of biodynamic vineyards and farms has taken root — with several of them now welcoming guests for farm stays. These local farmers — despite ostensibly being in competition — turned to each other for help in adopting a chemical-free, biodynamic system, which treats the farm holistically as one big organism of plants and animals. 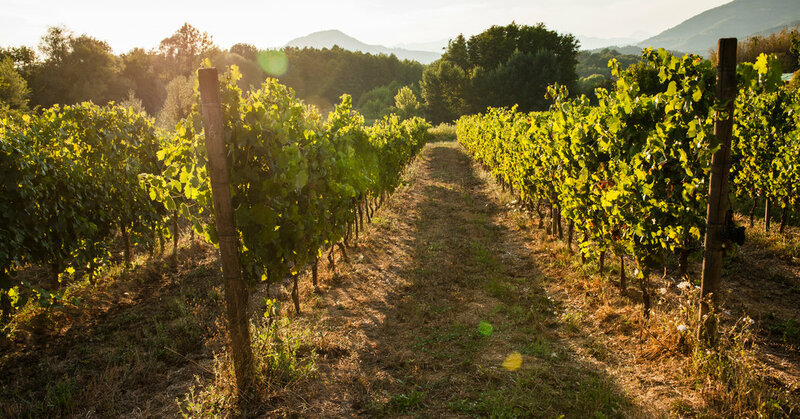 They established friendships and then in 2016, formally established the Lucca Biodinamica, capitalizing on the rising interest in natural wines. One of the pioneers of the Lucca Biodinamica movement, Giuseppe Ferrua runs Fabbrica San Martino, along with his wife Giovanna Tronci. In summer, the farm is a teeming, arcadian slope of greenery, where donkeys graze amid wildflowers and white-blossoming olive trees, and meadows of jade-colored grapevines blanket the terrain up to the woodland’s edge. The couple’s 1735 Baroque chateau neighbors the former peasants’ home where, from March through November, visitors rent humble accommodations filled with recouped country furnishings — enjoying the farm’s sylvan hush, learning about biodynamic agriculture, and tasting wines. Following the tenets of biodynamic vinification, the wines are fermented with naturally occurring yeasts, and bottled with much less sulfites and none of the 60 additives of industrial production. In biodynamic practices, originally espoused by the wide-ranging thinker Rudolph Steiner (who also inspired the Waldorf schools), San Martino’s farm animals, swallows, honeybees and plants contribute to a thriving ecosystem. To the mystification of skeptics, the farming calendar is determined by the heavenly bodies: growers harvest when the moon is full and sap rises in plants, mirroring the tides. Cow horns are packed with compact amounts of fertilizing manure or sunlight-attracting quartz and buried underground over winter. In springtime, their contents are sprayed with rainwater on the land. “Everyone in our circle converted to biodynamic because they could see and taste the difference,” Mr. Ferrua said. Of Lucca’s 18 winemakers, 13 are in the Lucca Biodinamica network, rendering it the most concentrated biodynamic cluster in Italy. Fabio Pracchia, a Lucca local and editor of the Slow Wine guide, credits the movement to this corner of Tuscany’s less-established wine status. Currently heading Lucca Biodinamica are Mina Samouti and her husband Matteo Giustiniani of Fattoria Sardi, who praise the willingness of the group’s many producers to share seeds, equipment, techniques and experiences. Fattoria Sardi, family-owned for more than 200 years, occupies two antique farmhouses — a winery and a guesthouse encircled by grapevines where crimson clover and golden mustard flowers naturally fertilize the terrain for the vineyard’s much-loved rosé wines. In their lodgings, guests can cook vegetables from the garden to accompany the wine, or receive cooking lessons or meals from the produce-growing team of another Lucca Biodinamica farm, Maestà della Formica. The more modern Tenuta Mareli occupies the rebuilt former carriage house of a neighboring church in Lucca’s countryside. Owners Francesca Tomei and Daniele Lencioni created rustic-style rooms — sloped wood-beam roofs, quilt-topped iron-frame beds, and terra-cotta tiles — but with air-conditioning, heated floors, and a diminutive basement spa. Overlooking a hill of olive trees and a garden full of rosemary, lavender, and rosebushes, guests enjoy tastings of Mareli’s own honeys, jams, and wines, plus local pecorino and cured meats. Nico Bio, a vegetable plantation rather than a vineyard like the others, offers a more pared-down and pastoral farm stay of cozy little rooms amid dense, bucolic forest. Owners Elena and Federico Martinelli serve garden dinners of their biodynamic produce most nights, accompanied by Valgiano wines. At Nico Bio, there are donkeys, chickens, heat from solar panels, and water filtered by plants, but no Wi-Fi or cellphone signal, and unlike the rest of the farm stays, no pool. Laura Rysman, a regular contributor to T Magazine and The Times, shuttles between Milan and the tiny Tuscan town of Lucca, recounting a vast territory of local pleasures across Italy and beyond. Is the EU really united over Brexit?